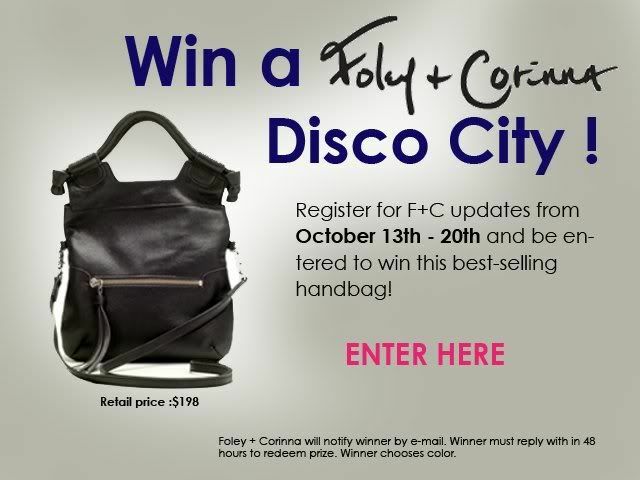 La Petite Fashionista: Win Foley + Corinna's Disco City Bag! I'm so excited to bring you yet another AMAZING giveaway this week! Foley + Corinna is a designer handbag & clothing label started in NYC by two fabulous fashionistas. It's beloved by celebrities and magazines around the world. Their handbags are effortlessly hip, constructed beautifully, and perfect for day or night. Their gorgeous fall lookbook perfectly evokes the stylish, downtown cool feel to their line; & it makes me want to go on a big city adventure. I can't wait to giveaway their adorably stylish "Disco City Bag" to a lucky La Petite Fashionista reader! (It comes in 9 other colors to choose from as well!). The contest ends 10/20/10 & is for U.S. Residents only. Just wanted to say love the photos here too! Ahhh what a lovely giveaway babe! The bag is beyond gorgeous and functional! To answer the question: Madrid! Feel in love with it ever since I was little, when I stared at pix of there in awe, and even more in love with it when I went there! Forgot to put my e-mail! I'm also a follower on Facebook - Kate Beebe! Amazing giveaway!! ;) I love New York City but recently having been craving a trip / adventure in London... one day! Thanks soooooo much for the chance! I signed up... and I would love to go to Paris! The lights, the fashions... so chic and beautiful! OMG, another lovely giveaway, so soon? What city would I want to go to? Easy, I am from NYC, && I seriously believe its the best place in the world. It has everything I love, good food, high/street fashion, different seasons, && most importantly, my two nephews. I grew up there, it will always be my home. Signed up for the email, my email is cupcakesandcosmopolitans@gmail.com, && already have you on FB. Amsterdam! i don't think you can get any more adventurous than that! Where would I go? I'm not entirely sure, there are so many places I haven't been. Don't get me wrong, Atlanta is a metropolitan city, but I would love to try somewhere new. Somewhere I can go with nothing holding me back. Paris? Prague? Tokyo? Sydney? Edinburgh? LA? Who knows...All I do know is that wherever life takes me, I'm not going to waste a single chance that fate gives me. Oooh, such a nice bag, a girl can always use another handbag :) I signed up for their email list! My email is dramaqueen711@q.com. Hmmm, where would I like to have an adventure? I'd have to say Phoenix, it's where I was born but I only lived there until I was 2 and I've only been back once. It's so pretty with the mountains, palm trees and desert. Signed up for their e-mail list. I signed up for Foley + Corinna's email list! I would love to go to Milan! The fashion capital of the world! Following La Petite Fashionista on facebook! I am SO in love with this bag. It. Is. Perfect. I would love to have an adventure in Portland. I know that sounds weird, but I live in the south and I would love to have Portland weather. And I can imagine the scenery is gorgeous. I don't know, Portland has been on my mind a lot lately. i would love to have an adventure in Paris! with my Foley + Corinna Disco City bag!! I signed up for Foley & Corinna's updates. Thank you for hosting this giveaway. I would love to have an adventure in the fabulous Seattle! I follow La Petite Fashionista on Facebook (catalina khalaj). I'd love to have an adventure in London! I would love to have an adventure in Rome! I'm already on the F&C mailing list - I love finding out about their new bags and sales! I would have an adventure in Paris, my favorite city in the world! Used to live just outside of London but haven't been there in over 15 years, I would love to go back there, see my stepkids who are now grown up and visit the places my late husband and I used to go to. Love the bag, and I've been wanting to visit Singapore for forever! One of my friends went to high school there and goes on and on about the amazing architecture, food, and shopping. Thank You Foley & Corrina - for a great giveaway!! NEW YORK is where I'd rather stay! I'd love to take my boys and show them what a REAL Downton looks like! They would be in AWE of the cityscape, would feel the pulse of the city, and I personally would love to see the glittery sidewalk in front of the Waldorf again. It's been YEARS! I need some bling! I am getting your emails! I'm signed up for Foley + Corinna's email list. I would love to go to Jimbaran in Bali and have an adventure there! I follow La Petite Fashionista on facebook. Bora Bora is on my mind with it's scenery. I signed up! I'd love to adventure in Verona Italy! Supposed "home" of Romeo and Juliet ;) Thanks! We've received your registration for Foley + Corinna email updates. Now you'll be the first to know about new styles hitting our stores, special events and Foley + Corinna exclusives! I subscribed to Foley and Dorinna’s e-mail. I would love to have an adventure in Rome, Italy! Sounds wonderful! Oh my, that bag is yummy! A fashion adventure in Bombay would be amazing. I would love to take my bag on an adventure to Italy. I can just see it now...me and my bag crusing throught Italy on a cream color Vespa stopping to try the cuisine and desserts! Would love a Paris adventure or a Roman Holiday! I still have never been to NYC, and I am dying for my introduction to the big city. I would want an adventure through Rome! so much to see. I would love to have an adventure in Taipei, Taiwan! I was born there, but was adopted as a baby. So, I'd love to return to my birthplace and gain perspective about my own life and how different it might've been had I stayed there. I would love to have another great adventure in London! I'm following you (& Foley &Corinna!!!) on facebook and twitter (and bloglovin!) And I re-tweeted the contest to my followers!!! I hope I win! I love F&C and I'm desperately in need of a new bag!! I would love to have an adventure in NYC! I've only visited the city once, but I loved it! I signed up for the email list/followed you on FB! Great bag! Would love to rock it in Miami! Signed up for email list! I'd love to hang in Tokyo, that's my dream! I signed up for Foley + Corinna emails. I'd like to have an adventure in Moscow! Who was the lucky winner?